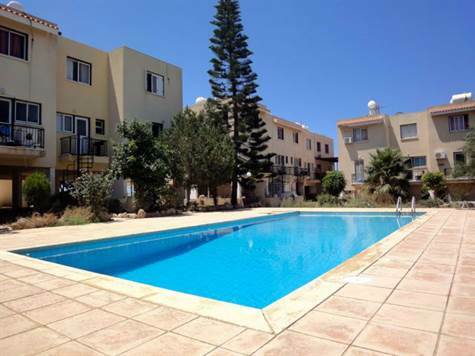 Cyprus Property Blog by Cleo : Great Price Reduction - Nice Chloraka Townhome only 69,000! Chloraka Village, Paphos - This 2 bedroom townhouse is located within walking distance to the popular village of Chloraka, which has a wide range of local amenities. Paphos, the coast road, and the local beaches are a few minute’s drive away. The ground floor features a spacious living room with lounge, dining area, end kitchen with breakfast bar and guest cloakroom. There are balconies on either side, the first off the kitchen overlooking the swimming pool and a larger covered balcony with stunning sea views accessed from the lounge. Upstairs are two double size bedrooms both with fitted wardrobes and a family size bathroom. The master bedroom has patio doors providing easy access to a balcony with fantastic sea and mountain views - an ideal place to sit and watch the beautiful sunsets. The property is in need of a little updating and is priced accordingly. There is huge potential to make this a stunning home and due to it’s spaciousness and good location, it is ideal for permanent residence as well as a holiday home. A driveway and car port provides parking easily for two cars and there are full title deeds. Please refer to MLS #: 1314 when inquiring.